These are the names by which the synthetic version of vitamin A are typically listed on packaged food, skin care products and an assortment of other products. Get to know them well. And take care to read all the ingredient lists of all the processed food which you eat. You’ll be amazed to find how prevalent synthetic vitamin A is throughout the food supply, as well as the skin care, cosmetic and bath products. Quite honestly, The Health Coach has absolutely no synthetic vitamin A in his or his family’s life. Got it out many years ago when it was traced to a whole series of ailments, aches and pains, and health conditions which eluded diagnosis … for years. Couldn’t figure it out, until we consulted directly with Dr. Norman Childers at the The Arthritis Nightshades Research Foundation. That’s when we really got it! Dr. Childers had already convinced us many years earlier about the consequences of too much nightshade ingestion; this time he was right on target with both synthetic vitamin A and vitamin D ingestion. We took him up on running our own quasi-clinical trial and, lo and behold, everything began to change … very quickly. From that point forward The Health Coach has worked with health product companies to remove the vitamin A palmitate from their product lines; sometimes with success. Just what is it about synthetic vitamins which causes so much harm to human health? There are a number of different issues which deserve close attention. Synthetic vitamin A is an isolate. Where it concerns isolates in general, we almost alway see problems with digestion, absorption, uptake and assimilation. Vitamin A palmitate is a synthetic isolate that is simply added to milk and other dairy products to ‘fortify’ them. Just as it is added to grain products to ‘enrich’ them. 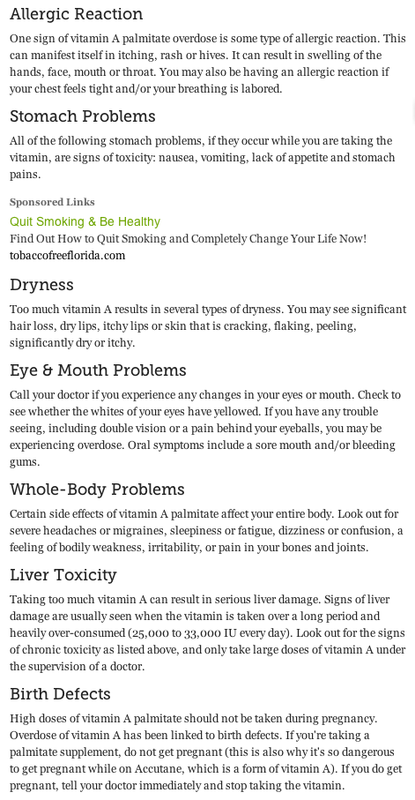 This has been occurring for many decades, so many of us baby boomers have had our fill of these toxic mimics which are different enough from the genuine vitamin that they are not properly recognized by the body. This is the real danger of long term consumption of isolates. That they are also synthetic and not the real McCoy makes them even more detrimental to delicate and sensitive parts of the digestive system. Here is some enlightening commentary from All About Nutritional Healing which was written by Judith A. DeCava, CNC, LNC. Truth in aging.com provides some more very important information regarding these synthetic isolates that permeate processed foods found in supermarkets and health food stores alike. “Retinyl Palmitate is a controversial ingredient because of its potentially hazardous side effects. Although it has many proven benefits, the Cosmetics Database rates it as a moderate hazard ingredient. It warns of potential side effects including cancer, developmental and reproductive toxicity, … cellular level changes, and organ system toxicity. Retinyl Palmitate has been shown to produce excess reactive oxygen species that can interfere with cellular signaling, cause mutations, lead to cell death, and it may be implicated in cardiovascular disease. It has caused reproductive effects at low doses in one or more animal studies, and there is limited evidence of cancer and skin toxicity, although it has been shown to be easily absorbed into the skin. “… because it converts to Retinol in the skin, it is important to note that Retinol, (along with Tretinoin) can cause severe skin reactions, including peeling, redness, scaling, itching, and burning. Formulas containing this ingredient, prescribed or OTC, are expected to cause some irritation upon use, although the irritation should decrease after approximately two weeks of continued application. It is also known to cause thinning of the skin, and therefore should not be used in conjunction with hair removal waxing (Wikipedia). Retinol greatly increases the risk of extreme sunburn; care should be taken (shade, sunscreen, etc.) to protect treated skin from overexposure to ultraviolet light. 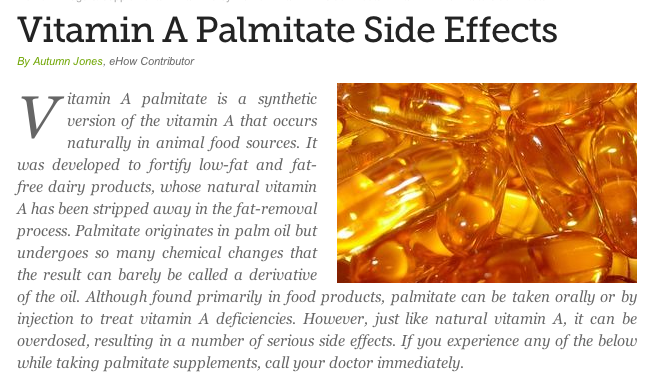 In closing, let’s end with one more description of just what vitamin A palmitate is all about. After reading this piece we hope that you will avoid this toxic additive as much as practically possible. For many of you, your health and well-being may depend upon it. If you’re not convinced by now, it is unlikely you ever will be. However, we would invite you to consult the many biomedical research studies found at PubMed – the National Library of Medicine, specifically on vitamin A palmitate toxicity and adverse side effects. There is much science that clearly demonstrate why synthetic isolates are fundamentally incompatible with good health. We chose not to focus on much of the arcane research which spells it out, since many would get lost in the details. We will elaborate more on this aspect in Synthetic Isolates – Part II.